After a little delay, it's time for the third Avengers vs X-Men event. The X-Men have travelled the world looking for Hope Summers and the Phoenix Force has finally arrived on Earth. Iron Man's "Phoenix-Buster" armour didn't stop the Phoenix, instead it just broke the creature into smaller forces which imbued five X-Men with world-changing powers. This month we re-enact that battle with a selection of X-Men and Avengers. The tournament changed up for this month, as we all get to use the Phoenix Force resource dial which was given to us in month one and the Phoenix shards which we've acquired in each tournament so far. We have six hundred points of Avengers or X-Men to pick teams from; the Avengers gain some bonuses but the X-Men imbue their team with new powers from the shards. It's... confusing. The dial was strange to get used to at first but between the YouTube tutorial and talking it over with the other competitors it seemed like something which just might work. The Phoenix Force has a dial with powers and modifiers on, which everyone assigned a Phoenix shard gets. They all also have a power based on a character who was originally one of the "Phoenix Five". If you knock someone out then the powers on the dial change up. If one of your Phoenixes is KO'd then the rest get more powerful to make up for it. So yeah, not too bad, just a little weird at first. Bishop, time cop and lunatic who can soak up power and spit it back out, with the Colossus shard to toughen him up when he's out in the field. Cable, Cyclops' alternate future son, he ran around time trying to hide his daughter from Bishop. I put the Namor shard on Cable so he had the X-Men team ability which he was originally missing. Hope Summers, Cable's adopted daughter who he hid with in the future. I put the Emma Frost shard on her so that she would get telekinetic powers. Jean Grey, an original X-Man brought to the present by Beast. She didn't have a Phoenix shard. I've seen what happens when Jean gets all Phoenixy and it's probably best not to repeat that. Phoenix, the alternate future daughter of Cyclops and Jean Grey, because my god there's a lot of weird family drama with those guys. I put the Cyclops shard on her which would give Phoenix better ranged powers. In my first game I fought Paul R who had a piece the X-Men players had been dreading in our regular team emails, an Iron Man who suffers virtually no damage from people holding relics (read: Phoenix shards, so most people the X-Men were playing). I think I saw four lurking out there, waiting to soak up any damage and laser people from a safe height. I’ve fought Paul before and he’s someone who takes advantage of the Avengers’ heavy-hitters (such as Hyperion in months one and two). He brought out Iron Man, Quasar, Scarlet Witch, Victoria Hand and made them the “Heroic Age” Avengers so they might not have an action token on them for moving. I won the dice roll and picked the “Flooded Wakanda” map, a great idea until I realised where the walls were and had to change up my plans. Cable, Hope and Phoenix flew to a radar dish which was sticking out of the ground. Scarlet Witch flew into a building on her own, the walls providing a good defence from my forces until Bishop teleported in and smacked her against a wall. It was fear of her ability to manipulate luck which had me target her first. She was a weaker version of the character though, and with Bishop on his own Quasar zoomed in for the attack. Paul had Victoria Hand carried around by the heavy hitters, boosting them as she went. I made up for the offending wall by shooting it open and sending my forces in. Cable stuck to Iron Man, in theory to keep him trapped in melee rather than attacking everyone. I had an idea with it, Cable could attack twice so even with the jammy “people with relics probably won’t hurt me” trait, I had two chances of harming him instead of one. It wasn’t enough and Quasar flew all over the map lasering people. I brought Phoenix into the battle a little too late. Bishop and Cable both died and in the last action Paul managed to kill Hope for an extra 75 points in one go. It was an ugly battle, too much of the time my enemy only needed low numbers to take on my people, it seemed entirely the opposite on my end. As a whole, the round was exceptionally close, a tie between X-Men and Avengers victories, with the X-Men just about ahead on points. The Avengers lost a shard they could assign to their people. One terrible fight under my belt, I felt a little more familiar with my newer pieces. The new battlefield was the Savage Land and my opponent Michael, a player returning after an absence of a few months. Another fan of themed teams, he picked the Great Lakes Avengers as his team, and there were a lot of the buggers. Fair enough, that sounds like one of the many humiliations Hawkeye would have to endure. With that confusion sorted out it was time to battle! Michael started and had enough pieces to effectively cut a line across the map with his people. Unlike my team they didn’t all fly and started on a ledge so they had to walk over a bridge to get to me. The Jean Grey I was using had different powers than my normal version; instead of moving people with telekinesis she can do a ‘running shot’ at enemies and carry up to three people when she does so. She wasn’t a powerful piece but as I was going second I could have her run at the enemy. Hope boosted Jean’s mental powers, Phoenix outwitted Dinah Saur’s super senses and Jean took her down in one go. There, my first KO of the day! Big Bertha ran at Cable with a weird power generator-looking thing, smacking him round the head. Bishop saw Deadpool and feeling like some 1990’s vengeance teleported at him, gun loaded. Deadpool’s a tricky sod with a power which means he might take no damage, or less damage, or more. He took the shot from Bishop and a bunch of the GLA ran in for backup. Squirrel Girl hid in a bush with her stealth power, but Hope used the telekinesis granted to her by the Emma Frost Phoenix shard and threw a dumpster into a bush. Normally you can’t use ranged attacks on people with stealth when they’re hiding, but telekinesis simply moves an object to a space. This one happened to have Squirrel Girl hiding in it, so she took the hit. The game had been a little slow, so despite a lot of potential fun, the call for, “last action” went out and Michael had Hawkeye charge forward to snipe Jean Grey. He hit, he killed. That was it, he scored 100 points for Jean compared to my paltry 25 points for Dinah. A last second win for Michael. Still, while it was short and still up in the air who would have won, this was a more entertaining game. The Avengers and X-Men had another tie for victories, but the Avengers had us beat on the point differential, so they won their shard back and we had to return one to the base. This meant that our Phoenix-imbued characters would be more powerful but there would be less of them. In this case the Colossus shard I was assigning to Bishop vanished. On my way to the tournament, I joked with my flatmate Lee about how we would both see each other on the battlefield as the respective worst of our sides. He’s an Avenger, I’m an X-Man, something which could still tear the fragile peace in our flat apart. As I had foretold, so it came to pass. Still in the Savage Land, I had to fight Lee’s Avengers. Be brought with him Captain America (with a stealth suit), Hawkeye, Scarlet Witch, Spider-Man, Tigra and Wonder Man. The Avengers started this game too, with Lee moving Spider-Man in a wide arc around my forces, Scarlet Witch was left fairly open in the middle. Jean repeated her taxi/gunner trick last time, then Phoenix followed and KO’d Scarlet Witch, removing the single support piece Lee had brought. After having lectured him on how it’s best to bring a support piece into his usual team of bricks, I couldn’t help but feel a bit bad for killing his one so early. Now he didn’t have easy access to probability control. Tigra and Wonder Man tried flanking from the opposite side to Spider-Man so Bishop daringly teleported to the pair of melee fighters and started gunning them down. I remembered to use the Phoenix dial and with the more powerful bonus powers, all my team had the sidestep power, a new addition which allows a small amount of movement for free. This meant that every turn I was able to shuffle my people to line up for better shots, hide in terrain or get out of the way of melee fighters. Hope and Cable gunned Spider-Man down with Jean Grey’s enhancement power boosting their damage. He never even made it to the fight. Bishop was ganged up on by Tigra but some terrible dice rolls kept him safe from most hits. He did take one smack to the head, gaining the ability to absorb ranged damage in time for Captain America to attempt to fling a shield at his head. The shield hit but Bishop used the impact to heal himself, then cause energy explosions at Tigra, Captain America (whose defences were outwitted by Phoenix) and Hawkeye. Tigra was taken out from the attack. Phoenix finished off Captain America with another shot and Cable gunned down Hawkeye in the final action of the round. A decisive victory. The X-Men won this round, giving us a shard back and taking one from the Avengers. This round I was surprised to find Brighton Heroclix veteran Lamp as my opponent. It had been a bad day for him, so he was down to my level. We were again, in the Savage Land. This time he had a sneaky team with Ant Man, Captain America, Iron Man, Sentry/Void and Sharon Carter. We both started the round cautiously, maybe it was the initial failures, maybe it was that this was our last ditch effort at victory. I don’t know. Still, for Lamp’s Avengers this was very much the plan. Ant Man (whose miniature is just a base as he’s so tiny) shared his massive defence stat with the other Avengers hiding in the hedge. Sharon gave them all stealth so I couldn’t hit them from range. Flash back to the ride over to Littlehampton and my teammate Alex asking, “So who’s your melee person?” Oops. Iron Man ran out of cover and shot at my people. He missed, rerolled using probability control only to be met with a botch. I had one hand on the stack of team probability control counters, ready to spend one. I put them back down and watched Iron Man blast himself in the face thanks to bad luck. “I don’t think I’ll ask you to reroll that,” I said. To make matters worse I outwitted Iron Man’s defencive powers and had Jean Grey shoot him. It was that Iron Man, the one who suffers less damage from relic-holders. Jean was pure from the Phoenix, so he took a load of damage from her and ran back in the bush. Half of Lamp’s force were represented by Sentry and the Void, a single miniature who is Marvel’s schizophrenic drug addict Superman equivalent. He popped out for long enough to kill Jean Grey in one attack. Sentry was super powerful but the rest of my team managed to withstand his attacks, peppering him with bullets and psychic blasts. As someone who was impervious, a lot of the attacks were soaked up and I had no way to counter his powers. Still, he was the only person visible. Then Sentry hid in a bin. Bishop teleported at him and the pair kept fighting around the bin. The fight slowed down until I realised I needed to give up on trying to shoot Sentry and should start hitting the cowardly Avengers hiding in the hedge. Just as I did that, time-out was declared. Damn. Jean’s death lost me the fight. The X-Men won this month, despite some truly intimidating miniatures, teams and performances from the Avengers. John had Giant Man transporting people and then shrinking into ant-size, hiding in the pockets of the people he’d just moved around the board. Several Iron Mans provided challenges. Matt’s Black Widow was able to take the budget of team probability control uses that his opponents had, giving him enough luck to turn tables in his favour. The X-Men had their victors, including Jacob who won the day for the X-Men with his team of Colossus, Cyclops, Emma Frost and Namor, using their Phoenix-imbued versions. There were not a lot of points of damage between the two factions, so things are getting closer as we draw nearer to the dramatic finale of Avengers Vs X-Men. The final matter was the prizes. Everyone who turned up received the Emma Frost Phoenix shard and a miniature. There were two prizes to pick from; Hope Summers and a version of Professor X where he can walk. The winning faction had first dibs on which of the two miniatures they received. Almost every X-Man picked Professor X. The top three players received one of the four White Phoenix Hope Summers miniatures. The last was randomly given out to one of the other players as a fellowship prize. That winner… was me! I may have come third from last in this tournament, but I’ve ended up with a pretty damn good miniature, my second randomly-drawn fellowship prize. First Cable, now Hope. Awesome. Next month things change up for the final battle. Both sides can pick any selection of Avengers and X-Men. The people who played X-Men this far have to use a version of Cyclops and all their forces gain the keyword, “Cyclops’ Army”. The people who played Avengers have to use Hope Summers and/or Scarlet Witch, all their forces gain the keyword, “Uncanny Avengers”. 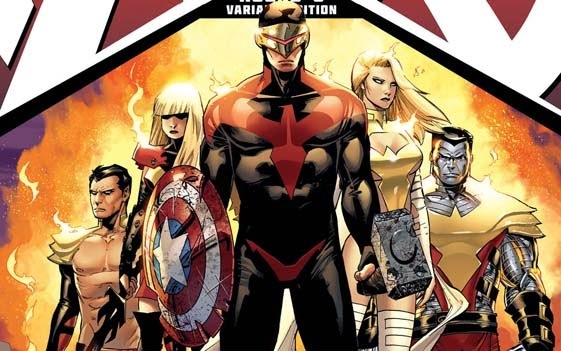 Apparently there will be events to represent Cyclops’ descent into madness in the AVX comics. I can’t wait to see what happens.